Jill Levenberg is a South African actress best known for her starring role as Mymoena Samsodien in the kykNET soap opera Suidooster. It was her first starring role in television. She has guest starred in numerous other television series including the sitcom Rugby Motors on kykNET, Final Verdict on SABC2, the sitcom Stokvel on SABC2 and the drama series A Place Called Home, on SABC1. 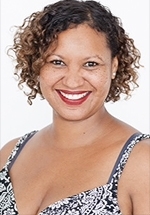 Jill has worked extensively in theatre since graduating from the University of Cape Town with a Bachelor of Arts (Honours) Double Major in Theatre & Performance and English Literature, making the Dean's Merit List in 2004. Theatre productions she has acted in include Orpheus in Africa and Blood Brothers, both of which were directed by David Kramer at the Fugard Theatre in Cape Town. She has also been seen in productions of Other Peoples Lives, I Virgin Boy, Breathing Space, Onnest Bo, Medea, Hamlet, Mephisto, Die Geel Komplot, The Third Coming, Harambe and The Great Gatsby. Films Jill has appeared in include Genadekans, Noem My Skollie, Fluit Fluit, As Ek Huistoe Kom, Abraham, A Cut Above, Tamarind, Pictures and Apron Strings.